Kamini holds a Master of Business Administration from the Schulich School of Business at York University, a Master of Social Science in International Studies and a Bachelor of Social Science in International Studies from the University of Birmingham in the United Kingdom. She is a seasoned project manager with expertise in executing strategic, operational and workforce development initiatives from the concept stage through to implementation and evaluation. Her practice areas include human capital development, market-based research, community development, government relations and policy development. She serves on boards of community organizations including the Francophone Workforce Development Council and the African and Caribbean Board of Industry and Trade. In addition, she works as a part-time lecturer at Seneca College in the areas of human resources management, strategic marketing, marketing research and non-profit management. 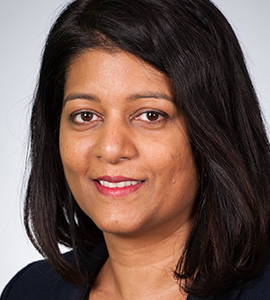 Kamini previously headed the strategy and planning function at the Centre of Excellence in Financial Services Education, where she led the expansion of key human capital initiatives and oversaw governance and measurement reporting. Prior to that she led community and stakeholder relations for a Federal member of parliament where she liaised with community organizations, initiated policy proposals, and implemented a range of community development initiatives. MS., Sahadeo also worked as a business consultant and project manager at the Canadian Imperial Bank of Commerce where she led major initiatives in the areas of management reporting, training measurement, investor statements and customer relationship management.